Whatsapp groups have become extremely common as it is being used by individuals, family and predominantly in business environment. Whenever you send a reply to a person, it end up being displayed to everyone in a group. While the option to send a message to a person in a completely separate conversation window is possible, it takes time and effort to get it done. Besides, it is difficult to continue having conversation in a group and having to switch windows each time to reply individually to each person. The developers have come up with a way to fix things and make them more intuitive so that you can enjoy group conversations. Private messages are easy to understand because all a user has to do is select a person from a group and reply to them. The message will be posted in a private window allowing only the intended recipient and the sender will be able to read them. It saves a lot of time spent in switching back and forth between windows during long group conversations. 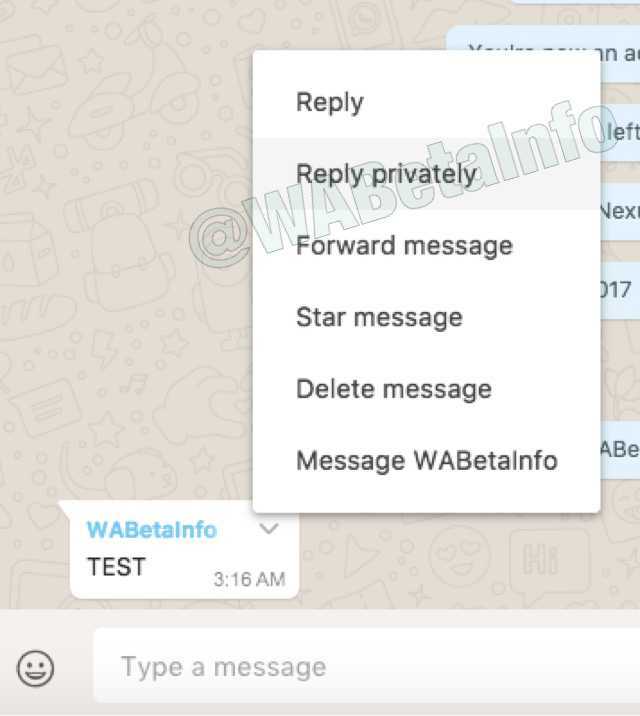 The private reply is what they call it and it was demonstrated in a closed beta version of the Whatsapp. Whenever you choose the reply privately option, it will immediately open a new window for the contact person. But, the quoted message from the group will automatically be carried to the other window so that you can easily discuss about it. The advantage in here is that users don’t have to manually click on a contact to open a chat but let the app do it for them. Whatsapp on web is a convenient option which saves you the struggle of having to type on a smartphone all the time. The desktop version of the app is about to become much better because the picture in picture mode is being rolled out to the program with a future update. The PiP was available only for Android smartphones that run on the latest 8.0 Oreo operating system whereas all desktop users could make use of this feature. The feature will allow users of Whatsapp Web version to click on a Youtube video link which will instantly open inside the same interface but in a standalone window. Users can choose to pause or play the video without leaving the Whatsapp interface. Everything will be done within your browser’s single interface or on the Windows app version if you prefer to use it.